All transactions are safe and secure with a reliable history in online purchasing behind each of our associates. Buy the Miller Gold Agency T-Shirt to own Entourage clothing and merchandise. Celebrate the Entourage TV series with this cool Miller Gold Agency logo t-shirt. Wear it as you utter Ari Gold's quote, "We're going to hell, so bring your sunblock." It's perfect for fans of Ari Gold (Jeremy Piven), Vince's manager, who often unleashes his frustration on Lloyd or one of the crew, including Eric, Drama or Turtle. 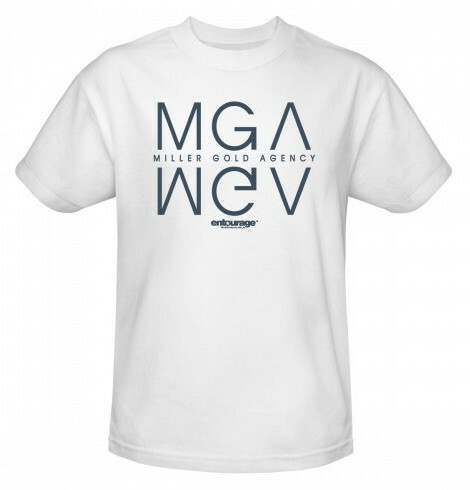 These Entourage t-shirts allow you to be part of the Miller Gold Agency. Be sure to pick up a bottle of SPF 1000 sunscreen. It works great in hell. In addition to the Miller Gold Agency T-Shirt above, browse the Entourage Clothing Gallery for more apparel like men's and women's clothes, kids shirts or hoodies.